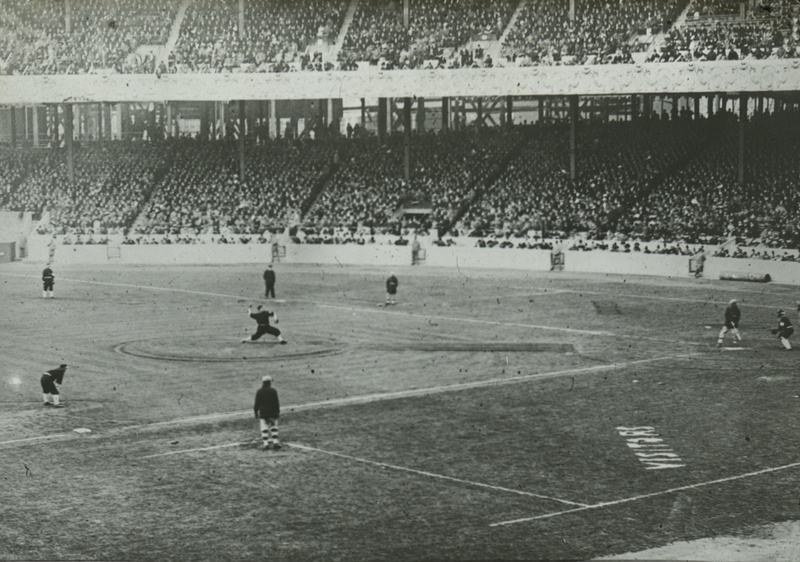 On his MLB Network program Studio 42, Bob Costas tonight referenced a blog post here from 2009, and asked Tom Seaver if he was aware that I’d found a game-action photograph of Christy Mathewson from the 1911 World Series that showed Mathewson using the exact of drop-and-drive delivery Seaver brought to perfection in the early years of his career in the late ’60s. Seaver said he’d seen the photo – I was pretty sure he had, since I’d sent a copy to him via a friend shortly after I found it in Cooperstown. That’s Seaver – coincidentally in action against at Shea Stadium the San Francisco Giants in 1975 – showing the “drop and drive” that usually left the front of his right knee dirty. There had been a lot of anecdotal evidence that Mathewson, who retired in 1916, had used a similar delivery. But until the kind curators at the Hall photo archive let me look at their collection of glass images from the 1911 World Series, I don’t think anybody had actually seen a game-action image of Mathewson. It’s the same delivery. In 1911. Needless to say, I geeked out completely when I saw that photo. I literally thought “Why is there a picture of Tom Seaver pitching in the 1911 World Series?” After I posted the shot in August, 2009, I ran into Bob at Yankee Stadium and he had seen the post and he geeked out completely over it. Just for the record, there are precious few game-action photos, particularly of pitchers, particularly in post-season action, from before the first World War. This was part of a series of 30 or 40 transparent glass slides, above three by five inches, that had been taken with a special camera for presentation as a slide show at the earlier movie theaters of the time. The Hall has what appears to be a complete set, and it constitutes a treasure trove for historians. You’ve heard of “Home Run” Baker? He got his name not for volume of homers, but for consecutive game-winning blasts off Mathewson and his fellow future Hall of Famer Rube Marquard in the ’11 Series. The slides include images of Baker rounding third on one of the homers. 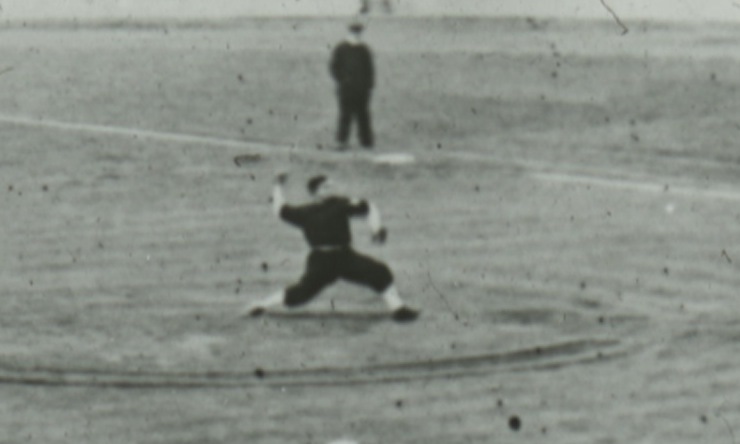 I’m not going to say there isn’t another game-action photo of Mathewson anywhere else (and I’m not counting all the posed and/or warm-up shots that show Matty fully upright or just soft tossing). I’m just saying I’d never seen one before this image, and I don’t recall anybody reporting having seen another. This is magnificent for several reasons – not the least of which is the extraordinarily low mound (which makes you appreciate Mathewson’s 373 career wins (plus five more in World Series action). But principally because that which historians thought really hadn’t become the standard for the “power pitcher” until the ’40s or ’50s, was in Mathewson’s repertoire a century ago. I love that very last picture. Now we know where Oakland-Alameda County Coliseum got the ideas for their baseball field dimensions. 😉 There is a ton of foul ground in that picture. I’m curious about the batter’s stance with the bat down at that point in the pitcher’s delivery. Looks like it was a lot easier in 1911 to get tickets to a World Series game. Was the height of the mound, if there is a mound, lower back then, or is it just an optical illusion due to the angle of the photo? Notice how the catcher is almost upright, and the batter almost looks to be in a Cricket stance. I don’t personally remember hearing anything about mound height other than that it was lowered following ’68. Was it legislated in the rulebook pre-WW2? If not, when did that start? Thank you for the pictures. Enjoy your columns, keep up the good work. Wow! Those fans from back in the day appear to be stiff. Everybody was behaving…or maybe all had the nuns for teachers! I love the good old days…and yes! That drop and drive lives on! How cool is that! Also, I noticed on the close-up of that last picture, Gumby is in the bottom left hand corner throwing hand signals! I am not kidding. You can see him if you look closely in regular shot…but make it real big and Gumby will be clear. When the hell was he born? Thanks for sharing this with us! I like learning my baseball from the best! Happy Holidaze. I just looked checked it out. Gumby was born (or formed) in the early fifties…so that has to be Gumby’s Gumpaw. No one knew he existed back then, either! Cool. Jeez, the fans are so far away, it’s like they’re in a different stadium. And those are truly eNORmous coacher’s boxes. To coin a cliche’, there’s nothing new under the Sun. 😉 Pretty cool when you find the older example to prove the truth of the cliche’. Interesting also is the “VISITORS” written in chalk (I presume that’s what is says). And both teams wearing colored uniforms. Also wondering if John McGraw is shouting “Look alive!” to his first baseman from the dugout. ….My next-born Son for an action shot of Ruth on the mound! 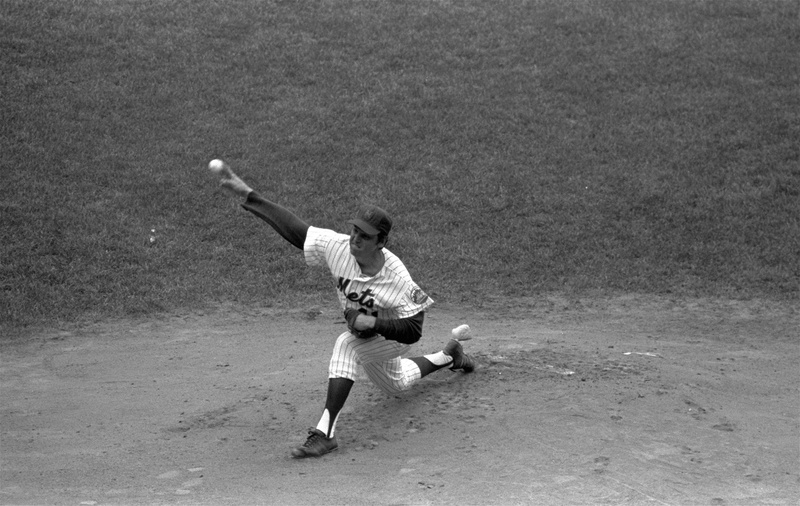 Another HOF pitcher with Seaver’s exact mechanics: Robin Roberts. The former. Peter Morris, in his compulsively readable reference book A GAME OF INCHES, documents how inconsistent pitching mounds were in the late 1800s/early 1900s — there was no consensus then that pitching from a 10-15″ height helped the pitcherm and many turn-of-the-century ballparks didn’t have any moundage (is that a word?) at all. I’ve seen newsreel footage of the 1910 Athletics-Cubs World Series, watching Chief Bender at Shibe Park take throws from the catcher and walking back to the pitcher’s box to deliver his next pitch. At no point does Bender appear to walk uphill. What a pleasure it was to have been a Mets fan in the late 60s and early 70s and see Tom Seaver pitching on a regular basis. In my mind, he set the standard for pitchers – solid mechanics, great stuff and smarts on the mound. I would be remiss if I didn’t say something about his pitching partner (and any Mets fan from that era will tell you they were definitely a matched set), Jerry Koosman. On a Mets broadcast this past season, Gary Cohen called it right when he referred to Koosman as the most underappreciated great pitcher ever. He came up to the Mets the same season that Johnny Bench came up with the Reds, and narrowly lost out to him as Rookie of the Year. He was part of a pitching staff that had not one, but two 300-game winners on it, so it’s a little understandable that people underrated him over the years. But Koosman was a great pitcher. Note the reception he gets any time he comes to a Mets’ old-timers event. The fans remember. Really appreciate your sharing this Hard to find a picture of Christy in action. Would love to see more like this. Terrific photo, but… Matty looks more like “El Sid,” Sid Fernandez of the 1986 Mets because, as is often the case in reproducing photos from any era, the negative is reversed and a right handed Matthewson appears to be left-handed. Perhaps this can be corrected and a true depiction of Christy Matthewson as the right-hander he was could be posted. Regarding the mound, pitchers’ mounds first start appearing in the late 19th century. They initially weren’t put in to give the pitcher a height advantage, but for drainage. Without a mound, the pitcher’s spikes will dig a hole, and in even modest rain he will end up standing in a puddle. Not all pitchers liked them, and into the 20th century they appeared and disappeared. Walter Johnson is said to have disliked pitching from a mound, so whenever he was scheduled to pitch at home the grounds crew would remove it. Clearly there came a consensus in favor of mounds and they grew higher and higher. I don’t know if anyone has written a history of the development of the mound. That would make a good SABR article. So far as I know, the lowering of the mound in 1968 was the first time it was regulated, and probably set a de facto standard, with everyone using the highest permitted. Richard Hershberger>> I understand that when the mound was ostensibly 15″ high in the 1960s, the grounds crew at Dodger Stadium causally raised it a few inches more for the benefit of Mr. Koufax. Tom Seaver? That stride length looks a lot more like Tim Lincecum to me. Hopefully now we can lay to rest the “they just tossed the ball up” CRAP. I knew this way back in 1991 when most people stupidly acted as if these dead-ball pitchers were girls or something. Morons.